You don’t need to cut out – the foil sticks neatly to ANY toner (which is heat activated through the Minc). 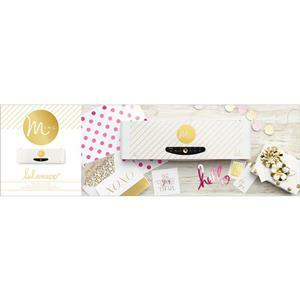 American Crafts-Minc Foil Applicator & Starter Kit. With the foil applicator, you are able to achieve amazing, professional, gorgeous foil effects like never before! Create little details or high- impact wall art. The sky's the limit! Has six settings, four rollers and motor directions going forward and reverse. Add amazing foil effects to your projects within a 13 inch wide work space. This package contains one 5-3/4x19-1/2x2-1/2 inch foil applicator, one transfer folder, one gold foil sheet and three starter tags. use it with sticker paper, copy paper, scrapbook paper and card stock and it works great!